Jim qualified as a social worker in 1982, and worked in a variety of social work posts for Grampian Regional Council, before joining Barnardo’s Scotland in 1994 . 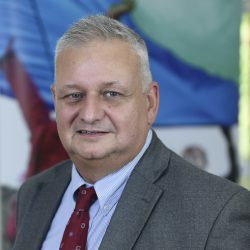 There, he undertook a number of roles including Assistant Director Children’s Services, Acting Head of Children’s Services and Head of Children’s Services before joining Aberlour as Director of Children and Families in April 2015. Jim has significant experience in setting up new services in response to need. He established both the Linksfield Project and Springboard service, which were the first services for Barnardo’s in the North-east of Scotland and the Highlands respectively. With Aberlour, he oversaw the launch of Aberlour Sycamore – Highland and Aberlour Sustain – Ross-shire, the first being a dedicated residential service for children who can’t live with their parents, and the latter being a preventative service, working with children that are on the edge of being taken into care.